Bobby and I had a wonderful day yesterday at the Hinnant Family Winery. It's a small winery that has a very nice friendly atmosphere and the gift shop was just beautiful. We enjoyed sampling a few items and also purchased a few items. Even though the vines are not green this time of year the view was still breathtaking. I actually enjoy seeing the vines without their leaves, because it allows you to see just how lagre and massive they have grown. We left the winery and then came back through Garner and had lunch at City Barbeque. The food there is really good if you like barbeque (who doesnt in the South) We had a platter with a selection of each of chicken, pulled pork, ribs, and brisket , along with sides of cornbread, baked beans, potato salad, pickles & garlic toast. If you take their survey while you are there you get a free slice of chocolate cake. I am not much on cake if it is not good but I have to say that it was one of best chocolate cake recipes I have ever eaten, minus the miniture chocolate chips on top of the icing. last but surely not least we went to downtown Raleigh to a cupcake shop because I love seeing what others are selling and like to always purchase a cupcake for sampling. I purchased a strawberry cupcake and without mentioning the name of the shop all I can say is they may want to consider another business. Me nor my kids could eat the cupcake as the taste was quite awful. The icing was grainy for a buttercream icing and the actual cake part tasted nothing like strawberry and had a dry texture along with a strong sugar cookie smell and taste which tells me that the flavoring has a long way to go . With that being said the entire cupcake went into the trash can after paying $3.77 for it. 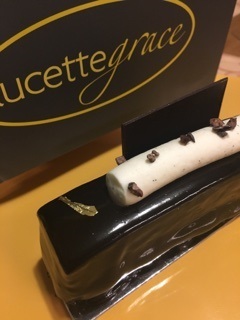 Our last stop was at the Lucettegrace Patissier and I am telling you that if you have never been there, you should go. 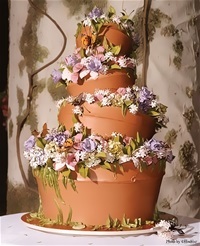 Besides the most absolute stunning beauty of the pastries the taste is beyond imaginable! It was very special for me as I love anything to do with cakes & pastries but I also watch tons of movies and series from orientel film makers, the Patiissiers in the films are always making and having competitions for there pastries. I love the beauty and the talent of it. Bobby purchased some Macarons for the boys, and I got a dessert for myself to sample. I will tell you right now that it was difficult to even cut something of such effort and beauty. One bite was all I could eat because it is so awesome and rich that one bite is enough a one time. The photo in this post is of the dessert that I purchased for $6.95 and honestly I would easily pay $10.00 for it, that is just how good the expierence of eating it is. Each and every time I spend time downtown Raleigh I think of just how much I love this city. Raleigh just has so much to offer, especially if you are into events, art, culture, and dining out. If you are ever in Raleigh take time to stop by Lucettegrace, you wont regret it and it will be a nice experience. Thanks for a wonderful fun filled day and for lunch Bobby. You are awesome.